Through his six seasons with the Trail Blazers, Damian Lillard has been NBA Rookie of the Year, an All-Star, team captain, resident superstar and able representative of the city of Portland. 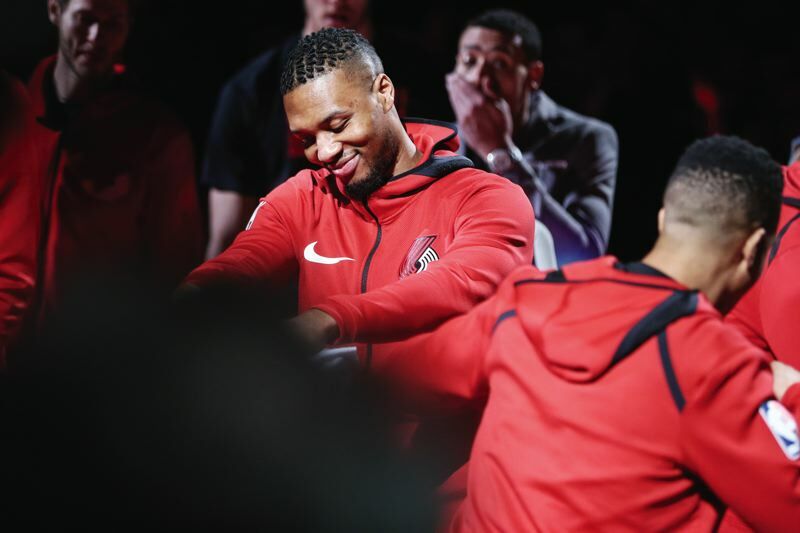 But lately, Lillard has taken his basketball exploits to an almost otherworldly place, leading the Blazers to a 10-game winning streak as of presstime, and the third-best record in the Western Conference heading into the final month of the regular season. 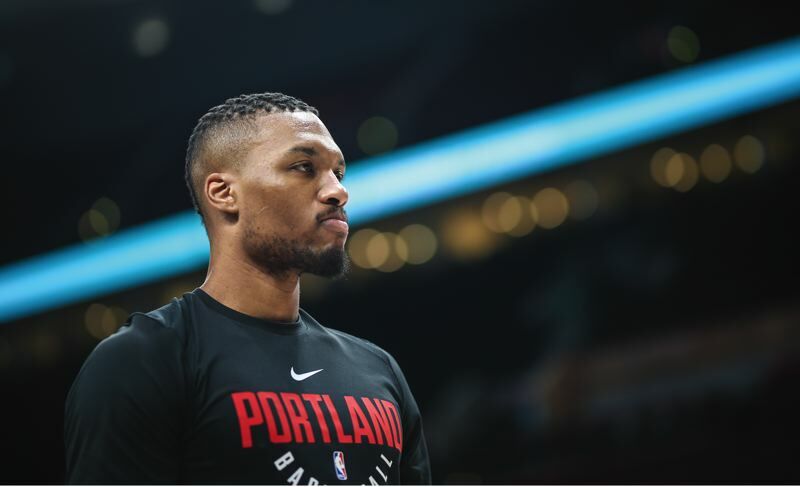 Lillard, 27, sat down with the Portland Tribune recently for a lengthy chat about a plethora of subjects, including his growth as a player, his vegan diet, his thoughts on being a Most Valuable Player candidate in the NBA, what being the Blazers' franchise player means and his impending fatherhood. Tribune: Since the All-Star break, you've been on an amazing individual scoring tear. Is this the best stretch of games you've had in your career? Lillard: I'd say so. It's the result of growth. Each year, the game slows down a little bit for me. There's something to say about experience, about knowing coverages, about knowing what (opposing) teams like to do. Over time, you learn so much. You're continuously working on your game — that's one thing. But there's also the level of comfort, the familiarity of being in certain situations. You're able to do it at a higher level. Tribune: Former Blazer Clyde Drexler used to say an NBA player's physical peak is between 28 and 32. Do you think you are still climbing toward your peak of physical prowess? Lillard: I do. The last two summers, I feel like I'm learning more about my body, how I feel and how I'm supposed to feel, and the things I need to do to feel that way consistently. It's about making sure I'm at my best, and it's the same thing mentally. You mature. That's what's happening with me. Tribune: What did you do differently in your preparation during the last offseason? Lillard: One of the biggest differences was I changed my diet to vegan. And I made sure I got my rest. Typically, I'd be really focused during the season in getting sleep, but in the summers, I'd be up late, partying sometimes. Sometimes flying late. I was doing anything, because I knew it was summertime, and I wasn't going to have to play for months. There's something to be said about taking care of your body in the offseason. Not that I was doing crazy stuff with my body, but it was like when you cater to your body over the summer, that adds up. I did a much better job with that last summer. If I was tired, I didn't force myself to stay up. I'd take a nap. I was eating a good lunch, a good breakfast. I did a lot of hot yoga. I went on hikes. Swam a lot. I did bike rides. A lot of stuff like that, stuff I wouldn't have done in the past. It was easier on me, relaxing and calming. Stuff I wouldn't have done in the past. It put me in a better place. Tribune: Are you still on the vegan diet? Lillard: No. I started in the summer but went off it in December. It was really good for me, but my body needed to go off it. I'm eating a lot of fish now, but some meat, too. I'll go back to vegan after the season. Tribune: How do you feel physically at this point in the season? Lillard: There is always going to be some wear and tear on the body over a long season. You're going to feel beat up sometimes. But I feel really good. Tribune: You have hit some deep 3-point shots through your career, but never more than in the past stretch of games. It's like you're almost taking it out to another area code. What did you do to develop that kind of range? Lillard: I've had that kind of range since I was a kid. When I would play horse with my brother (Houston) and we wanted to make it hard for the other guy to make it, we wouldn't shoot a trick crazy layup. We would shoot from further back. Like, "Shoot from here without jumping," or, "Shoot from here off of two dribbles, and step back and shoot from way over here." That was our competition. Growing up, I naturally had the ability to shoot from really far. Tribune: You made some long ones in high school games, too? Lillard: The biggest shot I hit in high school was against an undefeated team. We were down by three points with maybe 20 seconds left. I shot from a few steps inside the logo. My coach was like, "Dame, do this, do that," but I knew what I was doing. I just rose up right over the top of the defender — tie game. Tribune: You're the Blazers' franchise player. What is your definition for that in the NBA? Lillard: It's somebody you consider your best player, but somebody who can carry the weight of leading the franchise, too. That means dealing with the good and the bad that comes with it. That means impacting your teammates' careers. Not just numbers-wise, but impacting them mentally, and having an impact on the kind of people that they are and how they see things. Also, having an impact on the success of the franchise and an impact on the city that the franchise is in. It's about a lot more than just what you do on the court. It's about how you represent yourself and the organization on and off the floor. How you treat your teammates and how you elevate your teammates. How you elevate your coaches. How you work with your coaches. All of those things play a part in being a franchise player. It's all a part of that responsibility. My teammates and coaches, everybody who works for this organization and people I cross paths with off the court, they know the real truth. They know how I operate. It hasn't been one day. It's been years of me being an everyday person. Tribune: How long did it take for you to achieve that kind of status with this team? Lillard: It takes time. Over this amount of time — it's been six years now — people around me have to know this is who I am. I practice every day and watch (video), and I spend so much of my life with this group of people. By this time, they'd have known if it was an act. Tribune: Who are the franchise-type players around the league you respect most? Lillard: I really respect LeBron James. I really respect James Harden. I respect Steph (Curry), Kevin Durant and Draymond (Green). I respect Anthony Davis and DeMarcus Cousins. Tribune: Who would you vote for Most Valuable Player? Lillard: James (Harden) has been MVP runner-up twice. This year, his team (Houston) is No. 1. He is having a great season. I think a guy like that deserves it. Tribune: How about you? Your name is getting mentioned as a candidate. Lillard: I mean, I want to win it. I know I'm in the conversation. Why wouldn't I be? I don't see a reason why I wouldn't be for MVP, or for first team all-NBA. From start to finish this season, I've played consistently at as high a level as any point guard in this league, as far as impact and production and team success goes. Tribune: You look comfortable with the ball in your hands and the game on the line. You've won several games with last-second shots through your career. Do you consider it pressure, or is it just exciting? Lillard: It's no pressure. It's a game. You're going to win or you're going to lose. I think I can shoulder having the success of hitting game-winners without getting carried away. And I can shoulder missing it and us losing the game and me being blamed for it without shaking my confidence or not being able to move on from it. Tribune: When you get in a zone shooting-wise, what does it feel like? Lillard: Every shot is going in. it's like, no matter what the defense does, it's going in. Tribune: Is it almost an out-of-body experience? Lillard: In the game against New York (on March 6), I made one shot where the (defender) was underneath me. I jabbed on the left wing in front of the Knicks bench, and he was right underneath me. I just rose up and shot it. It took me back to a moment in the gym. It was like, get your release up. Shoot the ball up. Let it fly. When you're in a zone like that, it feels like when you're hot in a workout. The ball is just going in. Tribune: Your popularity in the city has always been high, but it seems like it's at its highest point, with people comparing you to Clyde Drexler and Bill Walton. How does that make you feel? Lillard: It feels great. You want to be respected. You want people to appreciate you. I want to win a championship with the Trail Blazers for this city. I want that excitement for them so bad. Tribune: You also have a great relationship with the people around you in the organization, it seems. Lillard: Every person I deal with who impacts my life — (assistant coach) David Vanterpool, CJ (McCollum, a teammate), Coach (Terry) Stotts, (player development coach) Jon Yim — I want them to know that I appreciate them. They might not go crazy and get all excited when I say I appreciate them, but I know it feels good to have people appreciate your impact on them. With Coach Stotts, I want him to always be my coach. I want that for him so bad. Tribune: Your girlfriend, Kay'la Hanson, is expecting your first child. When is it due? How do you feel about becoming a father? Lillard: It's due in two weeks. We're having a boy — Damian Jr. I'm really excited. It's going to be fun. Tribune: You've released a pair of rap albums. Was rapping a dream for you from a young age? Lillard: Music has always been in my family. Even before I started seriously doing my own rap, I was always rapping. Before I began putting my music out after my NBA career started, the first couple of years, I was rapping in the summers. People just didn't know about it. It's always been a part of my life. I've always been a huge music fan. Tribune: Who have been your biggest influences from a musical standpoint? Lillard: Tupac Shakur. Nas. Andre 3000. Guys like that. Biggie (Smalls). People I grew up on. Tribune: After you retire as a player, will you focus on a career as a rapper? Lillard: I'm not sure. I'll always be involved in music at some level, but I want to be involved with athletes, basketball players. I want to help them after I retire. Tribune: How do you like this team's chances in the playoffs? Lillard: If our focus is where it needs to be, if our mentality is right and we're together, and if we really believe it as a group, anything can happen. Tribune: You said recently you want to become the greatest player in franchise history. Why is that important to you? Lillard: Anything I put my hands on, I want to dominate it. I want my presence to be felt. Great players have come through here. But when I leave, I want people to remember me as the best ever. I don't want anyone to come in here and do a better job than I did. I want people to say, "Yeah, we had this guy, and that guy and that guy. But Damian Lillard? He was different. When the game was on the line, we had Damian Lillard. When things were going bad, we had Damian Lillard. When things were great, we had Damian Lillard. Off the court, we had Damian Lillard." That's what I want the conversation to be like when I'm done playing.